Perimeter cooling is the traditional way to cool a data center usually by blowing cold under a raised floor and allowing the cold air to rise through perforated tiles in the front of the racks. This can be accomplished using chilled water from the building or a dedicated chiller. DX systems (stands for Direct Expansion use a refrigerant or air with an outside mounted condenser to cool the data center air. InRow Direct Expansion products closely couple the cooling with the IT heat load. They are mounted at intervals between the existing racks. 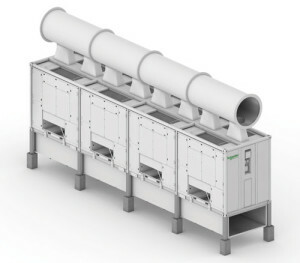 Because the cold air is dispersed close to the heat source, efficiency and control are increased. Cold air blows out the front of the unit and hot air is pulled in from the back so no raised floor is necessary. Economizers are the latest way to reduce cooling costs. They use cool outside air to provide “free cooling” and supplement the air conditioning systems. The built-in intelligence maximizes cooling while increasing efficiency. Small, inexpensive systems designed to augment existing air conditioning systems or to provide cooling for smaller rooms. They are available in many sizes and are portable to be moved to the exact location needed. Hot air is exhausted through ducting into the above ceiling air space. Simple, fully integrated, enclosed infrastructure that can scale with your data center or telecom network. Cold or hot air containment provides the maximum efficiency and control of the environment. Still not sure what type of cooling is best for your environment? Click here for an overview “Choosing Between Room, Row, and Rack Based Cooling for Data Centers”. To contact the experts at UPS Protection/Automated Power for more information on Data Center, Data Rooms or Telecom Closets, click here or call 800.755.0080.